UP Group D Recruitment 2018 Online Application are invited from Primary School, Income Tax. etc to fill upcoming 14,000 group d vacancies. Throughout sourcing state government will recruit in all primary School, Government Inter College (GIC GGIC). 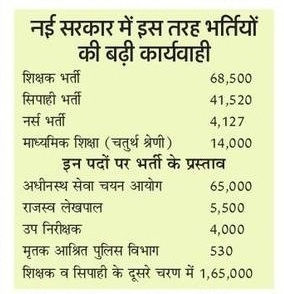 New Govt has planned to recruit some famous jobs in Uttar Pradesh which are Constable, Sub Inspector, UPPSC and UPSSSC. UP Group D Vacancy in Rajkiya Madhyamik Vidyalaya will soon handle by department called UPSSSC or any new formed department.So those Candidates who Are Interested UP Inter College Group D Recruitment just have to wait for few more months, Eligible can Read the Full Notice and Apply Online when released. 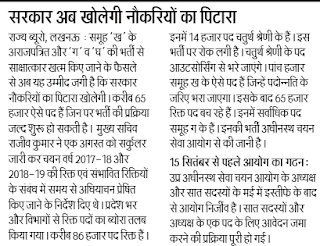 UP Primary School Group D Bharti:- UP Government selected one agency from kanpur to make recruitment process of Group D bharti (Helper, Mali, Safai Karmi) in School. This Notification will come after 10th March of UPSSSC New Notification. UP Rajkiya Madhyamik Vidyalaya Recruitment 2018: On 30th August in a meeting of UP Government said said they will soon opening group d 14,000 vacancy in all up department. 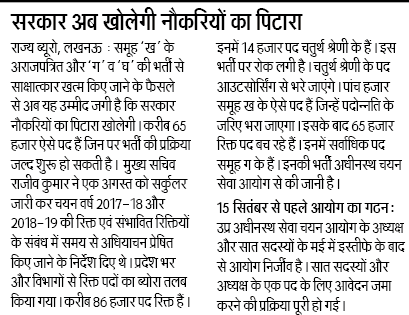 Educational qualification: Candidates who have passed from UP are eligible and having 10th pass mark sheet can apply for latest group d (class 4 vacancy). Special Preference: It is noted that in interview or written exam after only those candidates will be selected who have higher qualification or passed in 1 attempt. Department wise typing test also organized in English and Hindi. Application Fee: Examination Fee will be accepted Through Online or Offline Fees according to category such as General and OBC will pay Rs 100/-, and SC, ST, PH, Women no need to Pay fees. Starting Date for Online Applicant: soon updated. KHI BHI KUCH NI NIKAL RHI VACANCY. KB TK ISH NOTIFICATION PR WORK HOGA.